If you are a mum-to-be, you must want to stay fit and healthy during your pregnancy while also taking care of your baby. So if you are blessed to be pregnant and looking for methods that keeps you relax and healthy, you might be considering prenatal Yoga in Dubai. Prenatal Yoga is considered to be one of the healthiest ways to prepare yourself for a childbirth. However, to find out that whether such exercises are safe and healthy for you; you always need a professional trainer. Like other amenities, Dubai offers you a great assortment of clubs and training center that delivers you the best prenatal yoga sessions. It is significant to exercise and move your body while you are expecting. Simultaneously, it is crucial to only do those exercises that are appropriate for your body as per your pregnancy conditions. Dubai has many yoga centers that offer prenatal and postnatal yoga in their services. Here you can find the best professional trainers that makes you exercise under their strict supervision in order to take care of the health of the mother and the baby. We have mentioned below five best places that offer prenatal yoga in Dubai. They offer you the best prenatal and postnatal yoga sessions. Zen Yoga is a place that is constantly on the lips of every yogi mom; and it’s actually worth this hullaballoo. The place boasts around 140 classes each week with internationally renowned instructors that offers training in Barre, Pilates, Yoga and hybrid courses. The place also feature ‘Mummy and Me’ session where you can take your babies along with you to relax in a prenatal or postnatal yoga session. It costs AED 75 for each session. Zen yoga is located at the BBC Building #10, Dubai Media City, Village Mall, Jumeirah. Other studios are located at Emirates Hill and Dubai Marina. If you are an expectant mom, Yoga Mama Dubai is one of the finest place for you to understand your pregnancy and your body; while also learning about effective parenting. Prenatal yoga sessions are given internationally registered yoga teachers and prenatal yoga instructors. At Yoga Mama in Dubai, the prenatal yoga sessions are creative, dynamic and challenging that helps your body preparing for labor. Yoga Mama also offers parenting workshops too. Yoga Mama is located on Palm Jumeirah. This place costs you AED 400 for 6 week course. Breath and Health is an exclusive alternative medical Centre, which offers yoga therapy, medical massage therapy, energy healing, Ayurvedic therapy, spa treatment and much more. The place is highly specialized with highly professional staff. Breath and Health also offer an exclusive prenatal yoga session in Dubai, for expecting females while also assisting them maintaining a healthy weight during pregnancy. You may also be benefited by special workshops arranged by some experts, professionals and doctors. Breath and Health is located on Al Wasl Road, Umm Suqeim 2, Jumeirah – Dubai. Exhale fitness Studio is a premium ladies studio that is specifically dedicated to provide Pilates, Toning, Dance fitness & Prenatal yoga in Dubai. This place is truly feminine and can make you feel lively. Ranging from prenatal yoga in Dubai and Pilates to Hulaerobics, this place offers you true freedom while assisting you relaxing from all your worries. Exhale offers a wide assortment of class timings, so you can choose one that suits your routine. The place is very organized with changing rooms, lockers and refreshment bar. Prenatal yoga and Pilates session are specifically offered for mums-to-be. The place charges you AED 70 for each session, however they also offered packages that are comparatively cheaper. The Exhale Fitness Studio is located at Murjan, Jumeirah Beach Residence – Dubai. If you already have kids and entering motherhood once again; then you must be worried about taking care of your elder angles. If you are unable to manage a fitness routine because of your babies, then don’t put off, because Pure Fitness has got the right solution for your problem. This fitness center has got baby friendly fitness classes, where you can carry your babies along with you. And not only your babies, but their buggies too, as Pure Fitness will also make you learn that how can you use those buggies as a great resistance to tone your legs, abs and back. 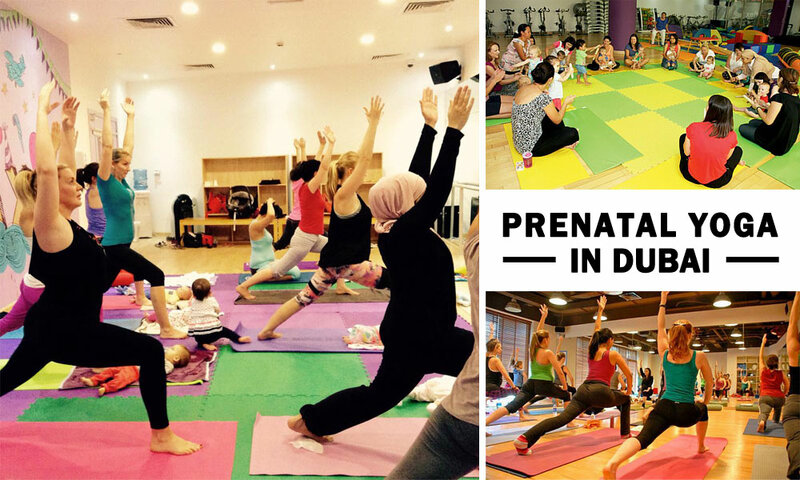 The place offers great prenatal and postnatal yoga session for mums and mums-to-be in Dubai. The session takes place at various locations such as Jumeirah Beach Park, Lakes, Barsha Park etc. Complete venue list is given at the time of admission with class timetable. These are some of the best centers that offer prenatal yoga in Dubai. If you want to recommend a yoga center that offer prenatal yoga, please do so by adding comments below. You can also explore activities to do in Dubai to make your trip a memorable one.